In a medium saucepan of salted boiling water, cook the rice over moderate heat until al dente, about 15 minutes. Just before draining, add the peas and cook for 1 minute. Drain the rice and peas well and spread in an even layer on a large rimmed baking sheet. Drizzle the 3 tablespoons of vinegar over the rice and peas and let cool slightly, about 15 minutes. 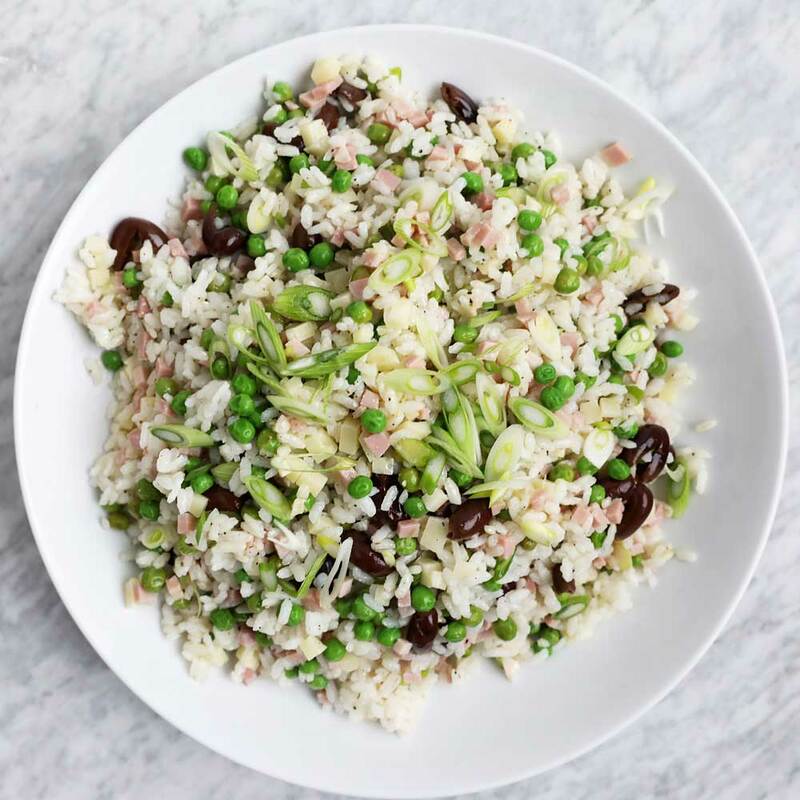 In a large bowl, toss the rice and peas with the cheese, soppressata, olives, sliced fennel, scallions and parsley. Drizzle with the olive oil and more vinegar, if desired. Season with salt and pepper and toss to combine. Garnish with the fennel fronds and serve. Review Body: This recipe is pretty good, but there are elements that drive me nuts. First, why are we using arborio rice, which by design is kind of creamy, and then we're told to let it "drain." Why not just use a less creamy rice? Also, I was not down with the use of white wine vinegar. This recipe calls out for a lemony vinagrette, and that's what I made and that's what I used. Other than these complaints, the flavors come together pretty well, and I will make this again, but I will also use another type of rice--maybe paella rice. By the way, I enjoyed the caciocavallo olives; I'd never tried them before. Nice complement to the rest of the ingredients.